Hardly any individuals in the 1970s, only companies and governments, actually OWNED computers, because they were so expensive, often filled up a whole room, and not many people had access to them. In those days, people were happy with and even amazed by games consisting of text only, no graphics, and probably no sound either, except an occasional beep. 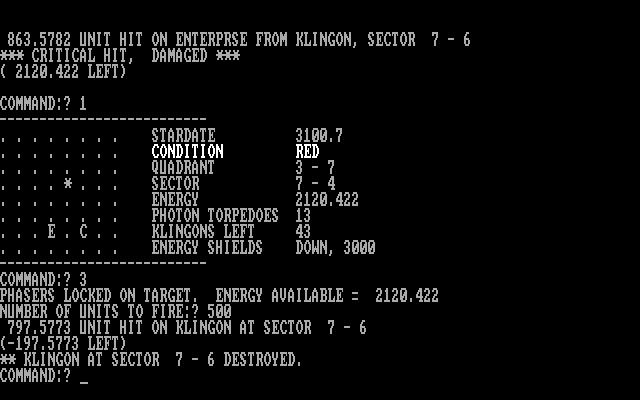 Some games which were popular with computer users at the time, included “Star Trek” or “Super Star Trek”, as well as “Colossal Cave Adventure”and “Guess My Number”. A lot of these games are listed in the book “BASIC Computer Games” or “101 BASIC Computer Games” by David H Ahl, published in 1978 http://www.atariarchives.org/basicgames/ . At the time these programs were originally written, hardly any computers had graphics and most microcomputers were probably either an Apple II, Tandy TRS80, Commodore PET, or one of various makes with different hardware running the CP/M 2.2 operating system. There was also access for a few people to mainframes or minicomputers, on text based VT terminal screens, or even just print outs, or punched tape or cards! 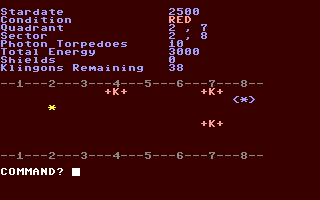 This was the only kind of game which could be created using Commodore 64 BASIC/Commodore BASIC V2. It could be slightly improved by using coloured text and a one channel theme tune, but anything more than this required numerous PEEKs and POKEs or machine language routines, unlike other computers of the time, such as the Acorn BBC Micro, Acorn Electron, Amstrad CPC, Atari 400/800/XL/XE, Dragon, Memotech MTX, MSX, Oric 1/Atmos, Sinclair ZX Spectrum, Spectravideo 318/328, or Tandy Coco. There were some Commodore 64 BASIC games listings, in books and magazines, which users could type in, but of course, these contained lots of PEEKs and POKEs, so it was pretty well impossible to follow what was going on, unless you could memorise a whole load of 5 digit decimal memory locations (e.g. POKE 53280,N = change screen background or border colour, POKE 53281,N = change screen background or border colour, where N=0 to 15, but I can’t remember which is which) and there seemed to be no end to all these numbers swimming around in my head! Before buying a Commodore 64, I’d done some memory courses which enabled me to remember numbers using the following ancient Greek or Roman system: S or Z =0; T or D = 1, N = 2, M = 3, R = 4, L = 5, J or SH = 6, G or K = 7, F or V = 8, B or P = 9. With this system, you could make up words or phrases to enable you to remember numbers, such as “lemon fizz” for 53280. Even so, I still couldn’t cope with the idea of memorising all these numbers, although it wasn’t necessary on any non Commodore computer, so I ditched the Commodore 64 after 10-11 months, a few months of that time making lots of trips to various shops typing BASIC listings into loads of other computers, to make sure I didn’t get conned again! « BASIC?! Don’t you need Machine Code?